Taos Sports Alliance – Sled Hockey Comes To Taos! Not Forgotten Outreach is bringing Sled Hockey, an adaptive version of the puck and stick game, to Taos! 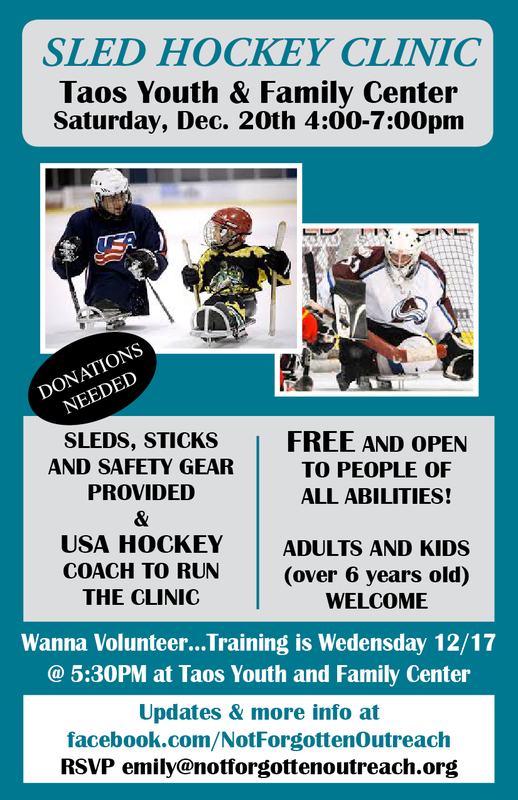 The Sled Hockey Clinic will be free and open to people of all abilities to learn this awesome way to play one of the most exciting winter sports. A USA Hockey Coach will be running the clinic and gear will be provided for those who want to come out and play. Sled hockey is a Paralympic version of ice hockey that has quickly become one of the largest attractions for spectators. It is fast-paced, highly physical and played by male and female athletes with a physical or developmental disabilities. Anyone who is interested in participating in this program in any aspect is encouraged to attend. We will be looking for players, volunteer coaches and volunteer referees for the upcoming season. The clinic will take place on and off the ice to encompass all areas of the sport. Please dress warm as it can get cold in the rink. All equipment will be provided. Donations of helmets, elbow pads, gloves, and shin guards needed for the clinic.For more information visit their Facebook page.